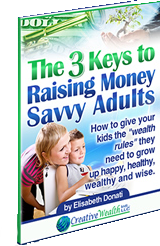 The 3 Keys to Raising Money Savvy Adults! Thank you for wanting to make sure your kids are prepared to not just handle money when they’re older, but use it to create any life they dream. Our theory, and we’re not alone, is that it’s never too early or too late to learn about money. Here’s a quick rundown of what we offer for your kids. Camp Millionaire can be as short as two-day weekend program called our Weekend Edition or up to 5 full days during the summer or a school break. The Financial Wisdom Coloring Books for Kids and Parents is the perfect financial primer and activity book for kids ages 3-10. The left side is written to help the parents explain the important financial principle on the right which the kids are coloring. Imagine learning about money in a fun way that opens up the financial conversations between you and your children in a simple, stress-free way. The Ultimate Allowance helps parents prepare their kids to live on their own successfully. It’s the only book parents need to raise financially free adults. Simply stop spending money ON your kids (cost of raising them, etc.) and run most of that money THROUGH them instead, giving them tons of practice before it really matters. Rocks to Riches is based loosely on the wealth and success principles in “Think and Grow” Rich by Napoleon Hill and appropriate for ages 9-14. Looking for a way to teach your kids about money and investing in the comfort of your own home? Creative Cash for Kids is a great home-study financial education program…perfect for homeschool parents and parents who realize the only way their children are going to learn about money is if they teach them! Let’s face it…if you want to win the money game, you have to know, and use, the rules. The Money Game is an interactive financial education game where the room is the board, the players are the pieces and the lessons last a lifetime. The Money Game is being used in classrooms, group settings, church groups and homes around the globe to teach kids and teens about money and investing in a whole new way. The Money Game can be played in as little as 3 hours but is best taught for a minimum of 6 hours. Creative Wealth’s Financial Principles are the basic principles financially free people have used for centuries to get, and stay, financially free. Learn them today! Looking for people in your area to teach our programs? Check here. We have many people around the US and globe using our different programs. Check out the financial literacy programs being held here. Note: not all of our coaches list their programs on our site so do a search for “Camp Millionaire” or “The Money Game” in your local area as well. Please consider learning how to use our programs by becoming a Creative Wealth Coach (online training) in order to teach Camp Millionaire or learning how to teach The Money Game or simply promoting a program in your area and hiring one of our trained coaches to come teach financial education to the kids and teens you love. Note: we are available to teach adult/child program combinations as well. Whether you’re a parent, a grandparent, a fosterparent, or other guardian of a child, we have great financial education solutions to offer you for just about any age. Check out our range of unique and highy effective financial literacy resources below. and parents who want to color with them. For parents who want to start using an allowance system that actually works! This home-study program will help you teach your kids about money and investing. If not available in your area, learn how you can promote one in your community. It’s never too late to teach your kids about money, but iit’s now or never!